Clinical studies demonstrated that didgeridoo sleep apnea therapy can be a serious method to improve the sleep quality and breathing during sleep. Although there are not too many studies related to this subject, learning about how didgeridoo can help improve sleep apnea may open new ways to understand the syndrome. Didgeridoo has the distinction of being one of the oldest woodwind instruments in the world, with origins dating back more than 40000 years ago, in Australia. They average about 4 to 5 feet in length, and are played by vibrating your lips into the top end of the instrument which creates a deep humming drone. The didgeridoo is a rhythm instrument, so you play "beats" instead of melodic songs. This makes the instrument very intuitive to learn to play, so you don't need to know music or take special lessons to enjoy playing the didgeridoo straight away. The didgeridoo does not require any "power" from your lungs like many other wind instruments. It is played with lips, voice, and tongue movement, not lungs. If you have obstructive sleep apnea (OSA), you may already know that one of the most common causes for pausing breathing during sleep is the upper airway collapsing. You also probably know that Continuous Positive Airwat Pressure is the standard treatment for OSA, but this therapy is not always tolerated. In fact, compliance is a major hurdle in treatment that sometimes cannot be overcome. One of the many alternatives to CPAP is didgeridoo sleep apnea therapy, where the circular breathing from playing the instrument is an effective therapy for improving mild sleep apnea and snoring. The study published by the British Medical Journal confirms that regular didgeridoo playing reduces apnea episodes, snoring and daytime sleepiness. Reports of didgeridoo players experiencing reduced daytime sleepiness and snoring after practicing, led experts in Switzerland to test the theory that training of the upper airways by didgeridoo playing can improve these disorders. The scientists identified 25 patients with moderate OSA and who complained about snoring. Patients were randomly allocated to an intervention group (didgeridoo lessons and daily practice at home for four months) or a control group (remained on a waiting list for lessons). Compared with the control group, daytime sleepiness and apnea scores improved significantly in the didgeridoo group. Partners of patients in the didgeridoo group also reported much less sleep disturbance. Although overall quality of sleep did not differ significantly between groups, a combined analysis of sleep related measures showed a moderate to large effect of didgeridoo playing. The breathing technique when you play didgeridoo - circular or cyclic breathing - acts as a pharyngeal muscle exercise and helps stiffen the pharynx to prevent collapse. Circular breathing is controlled by the muscles in the upper airway, and it means to blow out and breathe in almost the same time. This requires a lot of strength and development of the upper airway muscles. This breathing technique sound difficult to do, because you use your body as part of the instrument that your mouth becomes an airbag similar to bagpipes to keep the tone going, while sniffing in quick sniffs of air. But with the didgeridoo, the breathing technique is easier to learn and practice. Essentially you learn to use the tounge and other muscles in the back of the mouth to stop the passage of air while puffing or squeezing out air with your cheeks. At the same moment you are inhaling through your nose. The muscle movements from your upper airways is far more complex than the throat or tongue exercises for sleep apnea, and these movements should promote remodeling of the upper airways. Playing the didgeridoo also strengthens the airway and makes those muscles that have turned loose and soft firm and responsive to contract. How the Sleep Apnea Didgeridoo Therapy Works? The didgeridoo therapy is effective for those with poor muscle control and tone causing mild sleep apnea. People with moderate obstructive apnea can feel improvements, according to the clinical trial published in British Medical Journal. Bottom line... Patients with mild obstructive sleep apnea caused by flabby upper airway muscles are the target for didgeridoo sleep apnea therapy. is less effective for obese patients. But something is better than nothig. I would recommend to try something to get lungs capacity improved whether you have 24 inch thick neck or 15 inches. if you have a structural defect of the airway or skull. A small jaw or a large tongue is not for didgeridoo therapy. if you've had a significant UPPP, you cannot play a didgeridoo. It takes a lot of muscle tone in the neck to play the didgeridoo well. if you have central sleep apnea. if you have severe sleep apnea. 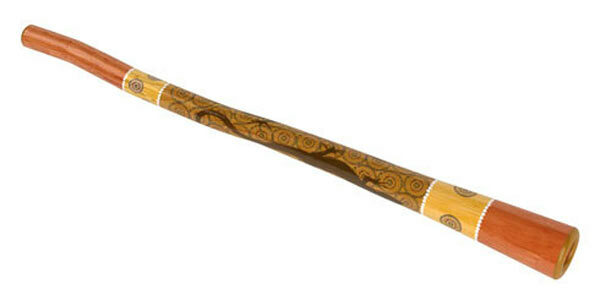 When selecting a didgeridoo for a novice there are two things to keep in mind: quality and portability. Straight away, demand quality. You can find cheaper didgeridoos everywhere online, but you get what you pay for. They can be a good choice, only if they are made from wood like this one. If they are made from PVC or other plastic, you will struggle to get that circular breathing, which is the key to improving your sleep apnea. Remember to read the customer review before buying. As far as size goes, buying a large didgeridoo because it's within your budget may not be a bargain at all. In fact, didgeridoos over 5 feet long and/or heavy didgeridoos over 8 lbs could actually discourage a beginner from practicing. The pitch may be too high or too low, and if it's very heavy, the instrument will be left behind on camping trips, a visit to friends, or a jam session with other musicians. The size of the player is much less important, as even a six year old tin lid can pick up the basic sounds straight away. Never assume that your OSA is to the point where you don't need CPAP without a sleep study to confirm that. It's folly to assume that didgeridoo sleep apnea therapy will help without confirmation on how it's working with your body. if the sleep test indicates apnea episodes and low blood oxygen levels, you need CPAP until you have positive proof that these things are working. CPAP is only a treatment for sleep apnea, not a cure, so you don't have to exclude it while you try the new didgeridoo therapy, or other alternatives. Click here to purchase an exceptional didgeridoo for beginners who want to practice circular breathing.